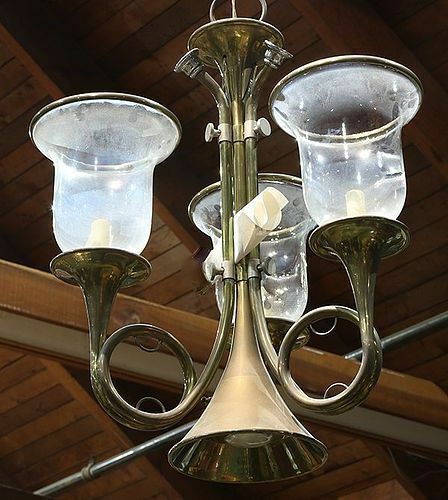 Really nice vintage brass 3-arm hunting horn chandelier. The 3 horn arms are connected in center to a large hunt horn that also has light in bottom. Heavy patina to brass. Also trimmed out with silver/chrome bands, knobs and mouthpieces. Made by Chapman in the 1980's. Original wiring but lights nicely. Pictures don't do this chandelier justice. Measures approx. 25" in diameter (widest part of globes) and 24" tall. Heavy solid piece. Hurricane/globes can be removed.